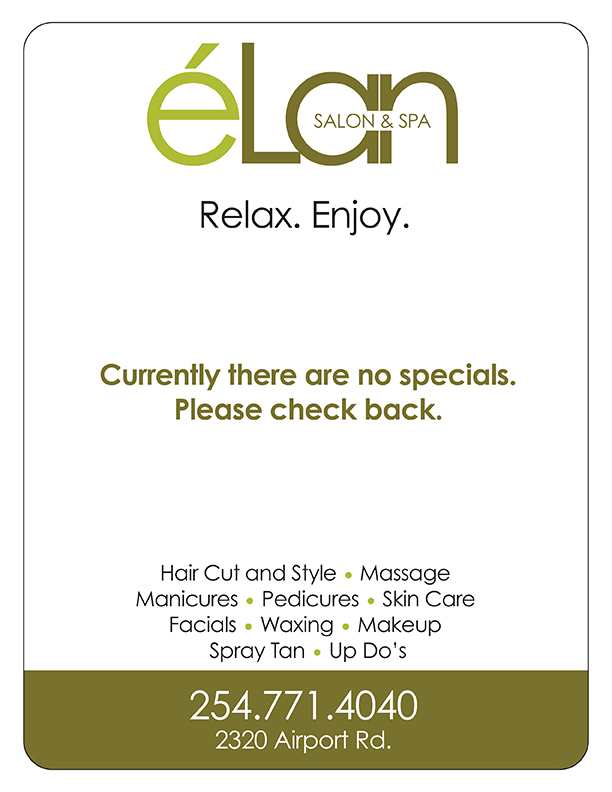 éLan Salon & Spa is a full service salon and spa located in Temple, Texas. Our professional staff is trained and experienced and are ready to fulfill all of your beauty needs. Whether you need a hair cut, color, highlights, manicure, pedicure, massage, wax, facial or SunFx spray-on tan, we do it all right here at our salon. 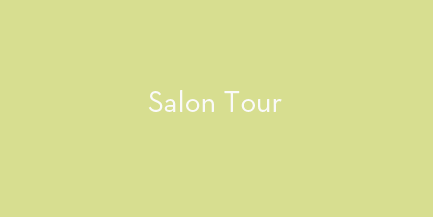 éLan proudly uses products by Aveda, Pureology, Kenra, Brazilian Blowout, Jane Iredale and Image Skincare. éLan owner Angelia Bass has always called Central Texas home. Her passion for cosmetology started in high school and has inspired ever since. In 1994, she married her high school sweetheart and moved to Temple, dreaming of one day owning her own salon. Those dreams started coming true in 2001, when she opened éLan Studio. In 2009, her idea of owning a full-service salon and spa came to fruition and éLan Salon and Spa opened in its current location. 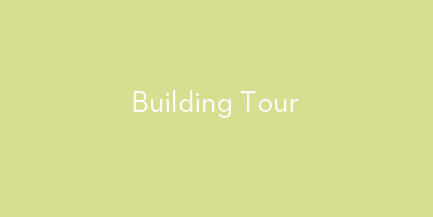 The beautiful building was built to her specifications by her husband's construction company. Aside from her two children, e'Lan is Angelia's #1 pride and joy. She continues to grow and learn, keeping up with the many changes in the industry, as is evidenced by her clients' satisfaction. Angelia feels blessed to share her passion every day with her wonderful clientele and her talented staff and can't imagine doing anything else. As a courtesy, we try to call or E-mail (based on your preference) a business day prior to confirm your reservation. However, if we are unable to call or reach you, please understand that it is your responsibility to update us on any changes to your contact information. In the end it is your responsibility to remember your reservation dates and times to avoid late arrivals, missed reservations and cancellation fees. If you are more than 15 minutes late, your reservation may be shortened to remain on schedule. The original service price will apply. If time allows we will try to accommodate original service. In the event that you miss three consecutive reservations without contacting the salon, you will be unable to schedule future reservations. However, you may be considered as a walk-in. We ask that you call us at least 24 hours in advance if you need to cancel your reservations. If time is critical to your schedule on a particular day, please make us aware of your schedule when scheduling your reservation. Extensive and multiple salon/spa services may require a major credit card to secure appointments. If you must reschedule or cancel appointments, please notify us 24 hours in advance to avoid an automatic credit card charge of 50% of the price of the services reserved. For a 'no show', your credit card is automatically charged for the full value of services. As a courtesy to other salon and spa guest, and in our efforts to provide a serene environment, we ask that you do not bring in a child if your reservation time extends one hour. If a child is under the age of 13 they cannot be left unattended at the salon. If you make a reservation for a child's haircut and the child cannot sit still or if the child is crying we will ask that we reschedule the reservation for another day. We welcome walk-in customers, however if it is not convenient with our schedule you may have a waiting period or need to schedule an actual reservation. Any returned check will result in a $35.00 service charge plus the face amount of the check to be paid before any other service can be rendered. We accept cash, check, MasterCard, Visa, American Express, Discover and Apple Pay. Our services have something for everyone. Whether you're needing a cut and highlights or an up-do, perfect nails and a spray tan for a wedding or special event, our stylists and techs can give you the look that others will envy. 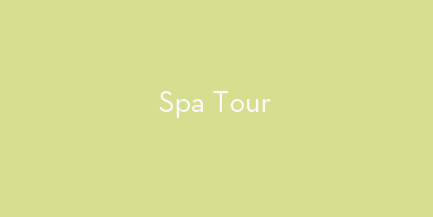 Our services don't stop there, let us pamper you too! We offer multiple massages along with facials and waxing. Our hair services have something for everyone. From rich and vibrant color, to styles and cuts that make an impression, our hairstylists have the training and experience to create a distinct look that is perfect for you. Visit us for your next special occasion and we can get you ready with a unique style that will make a lasting impression. We also offer Aveda haircare products to keep your hair healthy and looking great. * Please arrive 15 minutes early to ensure full time of service. You will be billed full price of service even if late. A quick way to relieve stress caused by everyday life. A full body massage using deep, precise pressure to improve circulation and relieve muscle and joint soreness. A full body massage using long, soothing strokes that promotes deep relaxation and relief from stress/anxiety. A customized full body massage that uses many different techniques to relieve deep muscle and joint soreness, alleviate stress and anxiety, and leave you feeling deeply relaxed and refreshed. Experience a luxurious full body massage using a special technique with hot stones that relieves deep muscle tension and promotes relaxation. A nurturing and relaxing therapy that focuses on the special needs of a mother-to-be by relieving stress on joints, neck, back and feet. Our nail services offer a variety of options for hands and feet. From perfectly polished nails that are finely manicured, to pampering pedicures that will leave your feet feeling soft and rejuvenated. Our nail techs will deliver perfect nails and complete satisfaction. *Any additional service for manicure and/or pedicure may require additional charge. Spray-on tanning is a fast and safe alternative to sun and tanning beds. Our spray-on tan is done by an experienced operator, unlike spray tan booths, and can be applied full body or to targeted areas you want tanned most. Our spray-on tan equipment is by SunFx, Australia, the world's number one professional spray-on tanning company. SunFX tanning solutions are 100% all natural, which means it is free from harmful chemicals, odors, alcohol and parabans, and it will not turn you orange. Please exfoliate before service, but do not apply lotion. Loose clothing is recommended after service, and allow 5 hours before showering. Most people can expect their SunFX tan to last for up to 5 to 7 days depending upon your skin type and preparation. Call for a consultation. Keep your skin looking great with a facial and feeling smooth with a wax. Our facials and waxing are performed by trained professionals and will leave your skin feeling clean and refreshed. We proudly use Dermalogica products for our facial services. Facial analysis is used to determine which product best suits your skin care needs. Customizable at every step, starts by cleansing the skin, followed by an exfoliation and deep pore cleansing. Once the skin is clean and polished, we loosen the muscles in the face by performing a relaxing facial message. The facial is ended with a masque and a skin hydrator. This treatment includes cleansing, exfoliation, extractions and a masque chosen for your skin type. Great for acne prone skin. This method removes the outermost layer of dead skin cells, leaving skin smooth and supple. It also can help reduce the visibility of acne scarring and slight wrinkles, as well as remove extraneous (translucent) hairs on the face. This line helps control triggers that lead to skin aging. Helps firm, smooth, nourish, and revitalize. This line helps jump start acne clearing with this purifying and detoxifying professional treatment. Also promotes clearing of the skin. This line calms and soothes sensitive skin by targeting the triggers behind redness, itching and stinging, while helping to recover skin health and long term relief. A 30 minute version of the Swedish Facial with no massage. This treatment includes skin analysis and cleansing to soften and smooth. We will aslo help create a home regimen just for you and your needs. Bridal and special occassion parties available upon request. We accept cash, check, Visa, MasterCard, Discover, American Express and Apple Pay. Tuesday - Thursday 8 a.m. to 8 p.m.